I welcome the opportunity to discuss your finds and help with identifications. Please include a scale in photos whenever possible. It doesn't have to be a ruler, a familiar object like a coin or pen will do. Daylight is ideal lighting, overcast conditions or in shadow on a sunny day will prevent harsh shadows, or try using directional light from a window to bring out subtle shapes or textures, as in the photo below. The most useful shots are from the side and underneath, showing the teeth. 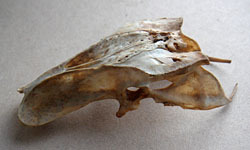 "Straight on" (perpendicular to the axis of the skull) is better than oblique. Where was it found ? i.e. which continent! It also helps to know the kind of habitat (mountain, coast, etc) where it was found. If you want to send me a specimen from within the UK, please ask for my address. There are many complex regulations covering the sending of wild animal parts between countries. I don't buy or sell skulls. Found one of these ? It's not a skull ! It's the equivalent of a pelvis in birds. You can see the backbone running down the centre and the two sockets which look like eye sockets are the hip joints. This structure is made up of several fused bones including vertebrae, sacrum, ilium and ischium.